Alyssa Lempesis is an emerging artist working and living in Oakland. She recently graduated with her MFA from UC Davis. I was curious about the deeper inspiration behind her sculptures, like people always are when looking at contemporary art. We ask ourselves, 'Why? Why do YOU make this work.' From simple observation, we can see that Alyssa’s sculptures and videos speak toward the raw and vulgar side of the body. Something which she has been fascinated by since childhood. To Alyssa, it’s not about her justification for her work that gives it its importance. There is a shared frustration with always having to justify our work through monumental moments in our memories. Of course, her work is personal but it’s also about the shared dialog between humans. We all have bodies and we all interact with them, we all have seen what can go wrong with them in some degree or another. Alyssa’s mother is one of eight children. Alyssa spent her summers in Miami, Florida surrounded by a large and growing family. The realities of life and health was and is something that affects her interests and therefore her work. But a large part of her inspiration comes from a wild interest into creating imaginative tactile sensations, something that can be seen as a driving force in her practice. lumpy - 2014 - fabric, rubber, dye - 60" x 36" x 36"
"wild interest into creating imaginative tactile sensations, something that can be seen as a driving force in her practice. " Alyssa created over 12 works for her solo show up at Aggregate Space in Oakland; all of them constructed in the last 6 months. “This body of work started with two very large pieces I thought to be microscopic organisms living in my gut." (Lumpy & Small Teeth) "They felt friendly, larger than body-sized as if I could crawl into one and use the other as a large pillow. One was created by establishing a shell and hollowing it out, and the other was generative and labor intensive, creating polyps of different sizes to coat with a waxy rubber. 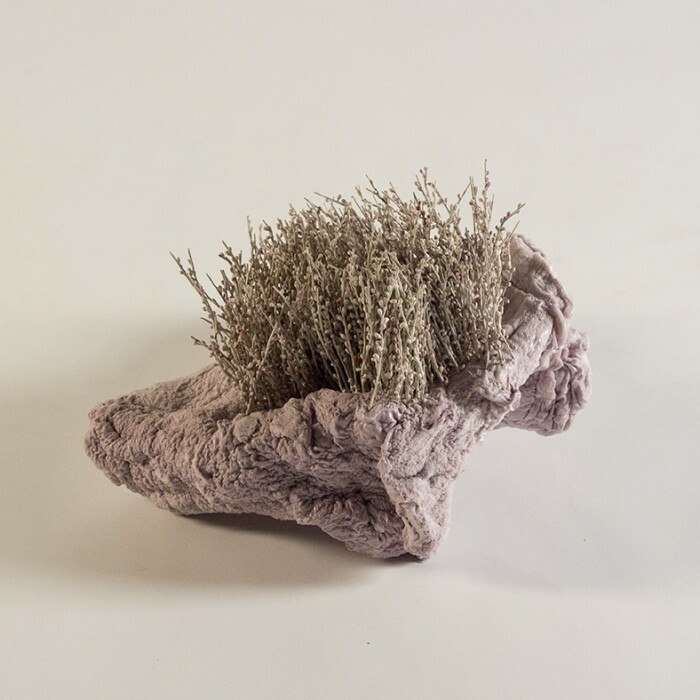 In the process of creating these works the small sculptures along the way began to snowball into larger works, growing rapidly from studio play, their qualities calling out to some kind of unknown body flora. I asked Alyssa how anatomy and surgery, the medical textbook, the hospital, the scientific side of the body affects her practice. 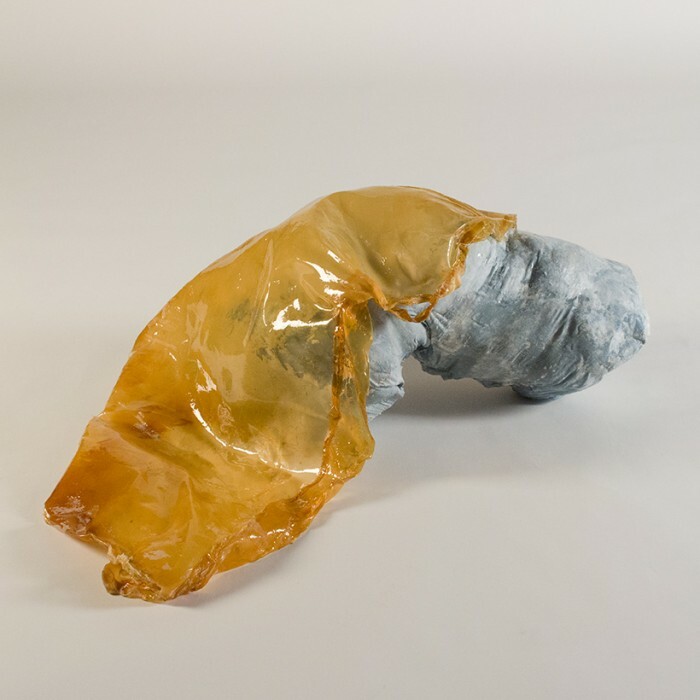 “Thinking about sickness and surgery resonates with me for personal reasons, and I find myself very attracted to materials that can stretch, crack, and be cut apart but also can be sewn or glued back together again. I have always been highly sensitive to my own “thingness” and have maintained a strong interest in wounds and repair. small teeth - 2014 - fabric, polyurethane foam, epoxy, dye - 72" x 36" x 30"
A category that is similar and yet different for every artist. In formal education, as a contemporary sculpture student we often are schooled and ripped into on our pedestal decisions. What or how you place the work is just as important as the work itself. It is something other art forms don’t have to be concerned about. Alyssa’s choices are unique to each sculpture. “I employ all the reasoning of my formal education and in the end I trust my intuition. Sometimes two things just want to be friends. You can see all of Alyssa Lempesis's work on her website and believe me when I say, she's got a lot of it!